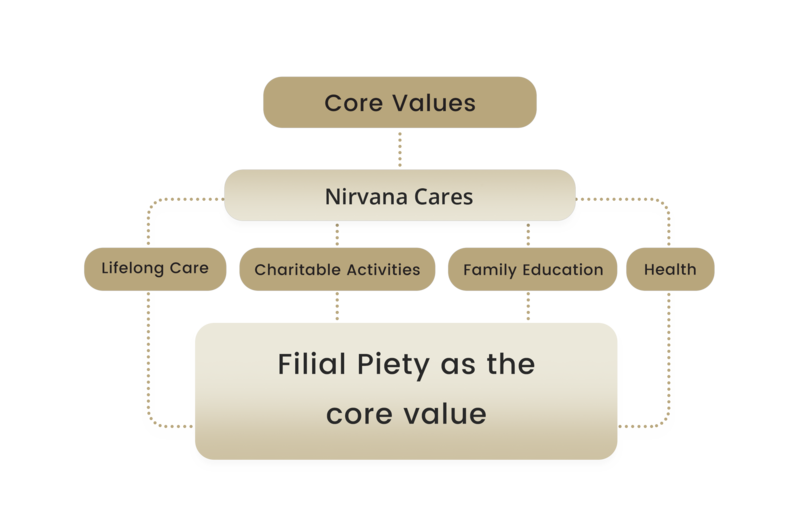 Nirvana Cares upholds the founding principles of Nirvana Memorial Garden all the time. We thrive on the ideals of a ‘Personalized Approach’ and the ‘Utmost Caring Spirit’. We treat filial piety earnestly; we spread our caring and sharing gestures to make life more meaningful; through our charitable and educational efforts, we reach out to the community with our hearts; and we promote spiritual health for a better world. These are the four obligations that bind us as a corporation together with the community. The essence of life is CARE. We deliver meticulous care and concern when it matters most. This is the eternal promise of Nirvana Cares. Life can be helpless at times, but we are there to offer our heartfelt care and concern. We are diversifying our community services and charitable efforts on a nationwide scale. We have formed a volunteer team to reach out to the poor and needy on this matter. We take pride in cherishing the development and sustainability of humankind and the environment. Nirvana Cares champions a holistic approach to defining the meaning of life. We proudly follow the tradition of educating the public about the importance of filial piety and care for the people around us, young and old, friends and strangers. This is how we instill positive humanistic ethics into our family institution for a caring society. There is always a calling to ‘Return to Nature’ where our origins are rooted. We can always co-exist with nature harmoniously. Therefore, at Nirvana Memorial Garden, we live by the concept of ‘Life Nourishment Village’, where we marry life nourishment and culture into one entity to enhance our quality of life.